The DHAS(Q) is pleased to announce the formation of the Queensland Doctors’ Health Programme Pty Ltd. Following the Medical Board of Australia’s offer to provide limited funding for doctors’ health services, the DHAS(Q) has been negotiating the details to use this opportunity in Queensland to develop a more sustainable and expanded state-wide service, including triage, education services, case management and strategies to raise the profile of doctors’ health issues. We have always relied on the generosity of the volunteers who have provided their time and expertise in delivering the DHAS(Q) 24/7 on-call service. To ensure that the new arrangements remain well separated from the Medical Board and AHPRA, the Federal AMA has set up a wholly owned subsidiary company – Doctors Health Services Pty Ltd (DrHS) – for oversight of this funding. This ensures the funding is delivered at arms-length to ensure that trust in the independence and confidentiality of doctors’ health services continues. To maintain clarity for Queensland, we have established the Queensland Doctors’ Health Programme (QDHP) as a wholly owned subsidiary company of DHAS(Q). Operational independence and confidentiality of client information will continue as before, with no requirement to report any identifiable information to DrHS or the Medical Board, other than as mandated by existing legislation. There is funding for a part-time Medical Director/CEO of the service and Dr Margaret Kay has accepted this role to establish the service. 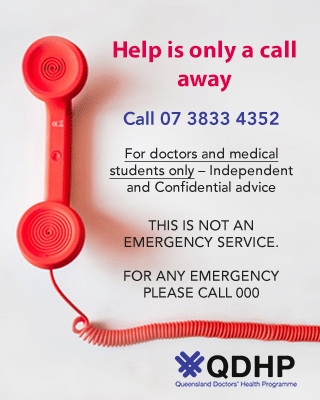 We look forward to expanding and developing our services to better assist the Queensland Doctor and medical student community in urban, regional and rural settings.